There are many understandable reasons for wanting a canine protector, such as living alone, needing a running companion while trying to stay active or perhaps living in an area where you fear crime and break-ins are a risk. Some businesses even use trained protection dogs. While often personal protection is key, many people purchase these dogs with family in mind. Not all dogs are suited for children. Think about it. Would you want a vicious dog in your home around your 4 year old? Of course not. You have to have a dog that is patient and playful…loyal and gentle. You need a dog that will let the children hug and tug on them. Not a dog that you have to worry will snap at them. Family life is chaotic. You need a dog that can handle the chaos. There’s the coming and going. The playing, fighting, and yelling. Crying, laughing. You name it. If you have kids, you know exactly what we’re talking about. Not just any protection dog is suited for such an atmosphere. Families have extended family and friends. A family protection dog needs to be able to distinguish between friend and foe. He has to be friendly with the friends and ward off any enemies. With so many breeds to choose from, picking the right dog for your needs can be tricky, depending on the kind of family you have (small children, other pets), your activity level, housing type (apartment restrictions), etc. The size of the dog, grooming needs and type of temperament are also key factors. But for those who want someone who can keep their home safe from intruders, frankly, a lot of dogs are not ideal protectors, they are just too trusting and do not have the right nature or intelligent awareness to keep a house safe. German Shepherds The German Shepherd is often the top breed of choice for trained protection dogs, as they have a mix of great temperament for families, manageable grooming and size along with sharp intellect. And fun fact: they are a favorite police breed for these reasons. 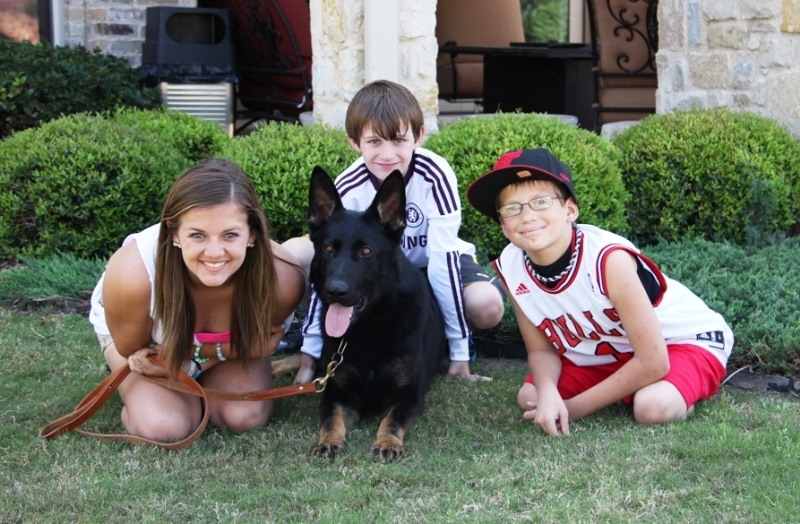 What else makes the German Shepherd the ideal family protector? They can sense danger. German Shepherds can be trained to tell when danger is near. That means they’re ready to jump into action even before danger arrives. They can distinguish a friend from an enemy. It’s in their DNA. A well-bred German Shepherd can naturally and intelligently tell if someone is your friend or not. This makes them ideal to have around the house, as you don’t have to worry about them being aggressive with the wrong people. They’re loyal. Once the dog has built a bond with you and your family, they will never leave nor forsake you. If you’re in danger, they’ll be by your side, no matter what. You aren’t home? That’s okay. They’ll still guard your family with their life. They are great companions. Of course, being a protection dog is only half their job. They aren’t simply hired body guards. These dogs make ideal companions. They’re beautiful and lovable creatures. This whole class of dog breeds are known as family guards, though some breeds are more common in the U.S. than others. Bullmastiffs were bred to guard large estates, but can be over 100 pounds. In Tibetan homes, fluffy large Tibetan Mastiffs are extremely common guard dogs who alert the household of visitors, though they are known more for their bark than bite and are rare pets outside of China. These dogs are very large and not ideal for apartments (often these breeds are not even permitted due to size) or indoor as family pets with young children. While some may have a cat-like temperament, a poorly trained or socialized Chow can become very aggressive. They are known for their distinct lion-like appearance. While traditionally used as guard and working dogs, their fluffy appearance and smaller size may not be ideal for warding off determined intruders. Getting the right temperament to suit both extensive family and professional protection needs may be tricky. The Doberman also has been commonly used as a police or guard dog. They are loyal and have very short coats and a squared stature. Although originally bred for aggression as a guard dog, in order to suit family lifestyle many breeders are toning this train down in favor of developing more companion-oriented dogs. These two unique Japanese breeds (the Akita can be up to 85 pounds and is larger than the Shiba) are known for their independent nature and habitual guardianship of their family. They can “rule the house,” but without proper training, they may not be the best protection dog. They tend to go at their own pace and may ignore commands, though they are famous for a heroic incident in Japan where a Shiba Inu intelligently led police to its family’s residence after an earthquake, saving their lives.